What a great day it turned out to be! 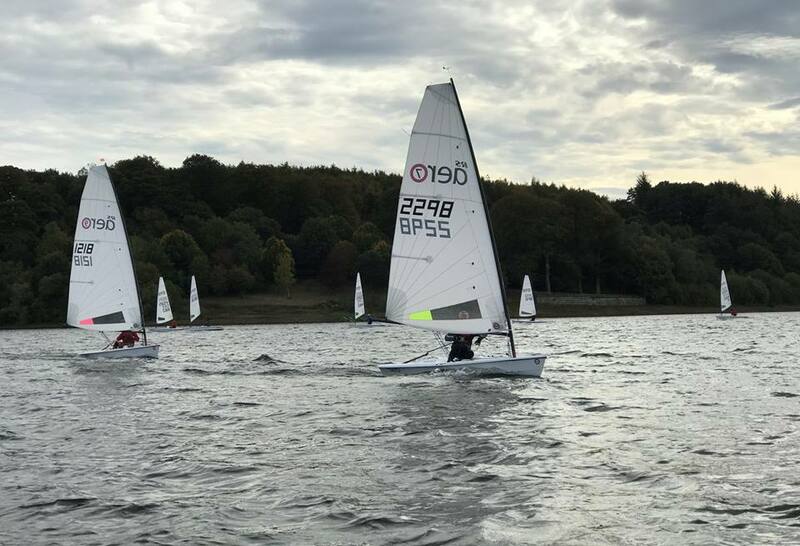 I can honestly say the RS Aero Class has always been friendly and our open event at Ogston was no exception, with good natured competition and a chance to see some old friends joining the class and to make some new ones from other local clubs. Sunday 7th October saw fair weather after the blustery overcast Saturday. 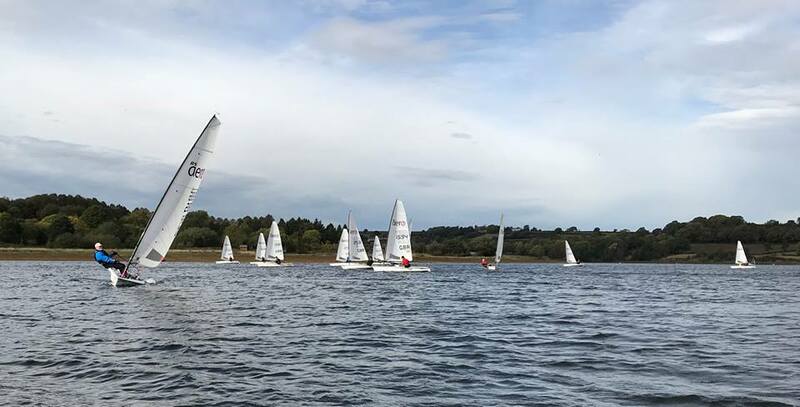 With the shared open at Ogston we were joined in the first start by the Challengers and Handicap fleet, starting ahead of the RS Aeros in a light 6-7 knot SE breeze. A clean start by the fleet of 17 RS Aeros soon saw them catching the Challengers and Handicap fleet by the windward mark. With a crossing of the reservoir around the cans the Aeros spread out and the leaders were quickly way out ahead. With the balance of the Aeros weaving through the Handicap fleet it was great to see Jackie Craven and Julie Archer not only battling hard with each other for the Lady’s title of the day, but also getting way up the fleet too. First race went to local Roscoe Martin, Jamie Rastrick from Yorkshire Dales in 2nd and fellow Dales representative Steve Stewart in 3rd. For Race 2 the course moved as the wind swung SW and built fractionally. Tight jostling and over eagerness on the line saw a general recall and chance for the race officer to square the line. Another nip and tuck first beat saw a battle royal with local Kent Martin getting to the mark first, but not staying ahead for long. Andrew Molyneaux and Steve Stewart again jostling all the way round in a tight battle with Jamie Rastrick again. Great close racing and a clear second bullet for Roscoe Martin, Andrew Molyneux never giving in and taking 2nd with Steve Stewart in 3rd. A terrific lunch was offered by the Ogston galley team and a quick turnaround after free pudding saw us back on the water for 2 more races back to back, with the water to ourselves for the rest of the day. The wind held true and stayed a constant 7/8 knts gusting 10 giving the chances for some planning conditions along with a few inadvertent capsizes and a taster for the charter sailors to sample the joys of an RS Aero in some breeze too. Race 3 saw yet another bullet from Roscoe, despite Andrew Molyneux’s best attempts to hunt him down, the rest of us followed up in their wake with Jamie Rastick again in 3rd . So with first overall decided, last race of the day went with a win to Ogston’s Kent Martin, despite a great deal of hard chasing from Andrew Molyneux and Steve Stewart, it was all very, very close on the line. So close that the overall result ended with Roscoe Martin 1st, Andrew Molyneux 2nd and Kent Martin in 3rd – by 1 point ahead of Jamie Rastrick and Steve Stewart tied on equal points and separated on count back! My thanks go to all the Team from Ogston for helping to host a great event, special thanks to Race Officer Andy Gomm, safety team and all on shore and in the galley! But a very special thanks go to those who made the effort to travel from clubs near and far – it was great to have you all join us. I hope we can be favoured with holding another RS Aero Open in 2019 for the Northern Circuit. Next up - after the UK Inland Champs at Chew Valley this weekend the RS Aero UK Northern Circuit visits Chelmarsh, West Midlands, on Saturday 20th October.